Dr Veronica is a Postdoctoral Research Fellow at the ARC Training Centre for Biopharmaceutical Innovation (CBI), under the supervision of Professor Steve Mahler. 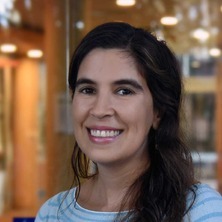 She received her Biotechnology Engineering degree at the University of Chile in 2007, and completed her PhD in Systems Biology at The University of Queensland in 2014. After completing her PhD she performed 2 years of postdoctoral training at The University of Queensland, as part of a collaboration project with Universidad de Chile. Both Ph.D. studies and postdoctoral training were financially supported by the Chilean Government, under a competitive scholarship and fellowship, respectively. She has also performed tutorial teaching in several courses at Universidad de Chile and University of Queensland. In 2016 she was in charge of the Beer and Biofuels practical, part of the subject: Biomolecular Engineering (CHEE4020) of the chemical engineering department at The University of Queensland. Her research focuses on the study of mammalian cell metabolism. She is specifically interested in (1) the development of computational tools for metabolic systems biology, and (2) the improvement of biopharmaceutical production processes. On the tools side, she has worked on the integration of thermodynamic principles and omics datasets into genome scale models to estimate metabolic flux distributions; and developed a method for estimation of dynamic metabolic fluxes. She has used these tools to describe experimental mammalian cells data and to guide the improvement of biopharmaceutical production processes. She has also been involved in the development of the latest human and CHO genome scale models. On the process side, she is currently working on the improvement of a high cell density culture, using systems biology tools to develop a cell line adapted to high cell density and to develop an improved upstream bioprocess. Martinez Salazar, Veronica (2013). Using network thermodynamics and metabolomics for the study of dynamic mammalian cell metabolism PhD Thesis, Australian Institute for Bioengineering and Nanotechnology, The University of Queensland.